Until recently, internists had very little guidance on how to treat prediabetes and reduce the risk of the full-blown disease. The most recent advice: Treat it early, with simple lifestyle changes. When the safety net us already stretched, losing even one internist can leave a community in crisis. The next wave of online patient web sites allow patients to compare treatments and results, pulling together data that looks and acts like a research study despite its source. CMS is partnering with private companies to address multiple health risk factors that contribute to senior's chronic diseases. A digest of this month's issue, including Alaska's shrinking primary care pool, the rising epidemic of prediabetes, and other issues of note. Considering a sexual relationship with a former patient, however brief the doctor's visit, raises issues after a romantic break-up. Genes dictate which patients smoke, quit and die from the habit. Genomics can provide small victories that will make a difference in many lives. ACP Hospitalist and ACP Press. Hospitals are working more closely with their admitting physicians to make them aware of the need for better documentation on pre-existing conditions. 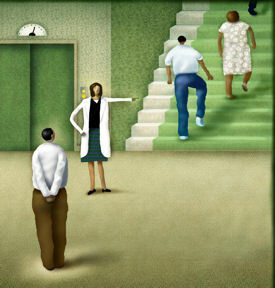 Doctors who are also mothers compare notes on raising kids and saving lives at the Mothers in Medicine Web site. The presidential candidates are steering away from the abortion issue, but a ballot issue in South Dakota keeps the issue alive in voter's minds. An increasing percentage of adults experience limitation of activity as they age. The deadline for submitting new resolutions to be heard at the April 2009 Board of Governors Meeting is Friday, February 20, 2009.